Cooking Perfect Rice – Cook Food. Eat Food. Cooking rice. More to the point – nailing perfect rice every time you cook it. Anyone who cooks will have their own, preferred method – it’s a bit like cooking the perfect steak – many an argument has been started on the subject. This is serious stuff alright. Rinse the rice – This helps remove the excess starch that can cause stickiness (which we want to avoid unless you’re cooking sticky rice). Put your rice into a pan and fill with cold water. Rub the rice grains with your hands to help release some of that starch. Drain off the water and then repeat the process with clean water. Do this until the water begins to clear. It will never clear completely and, to be honest, by the time you’ve done it ten times you’ll probably be getting bored but by then the rice should be good to go. Soak the rice in salted water – Soaking the rice before you cook it allows for a much shorter cooking time which results in rice that hasn’t been bashed around so much in the cooking process. 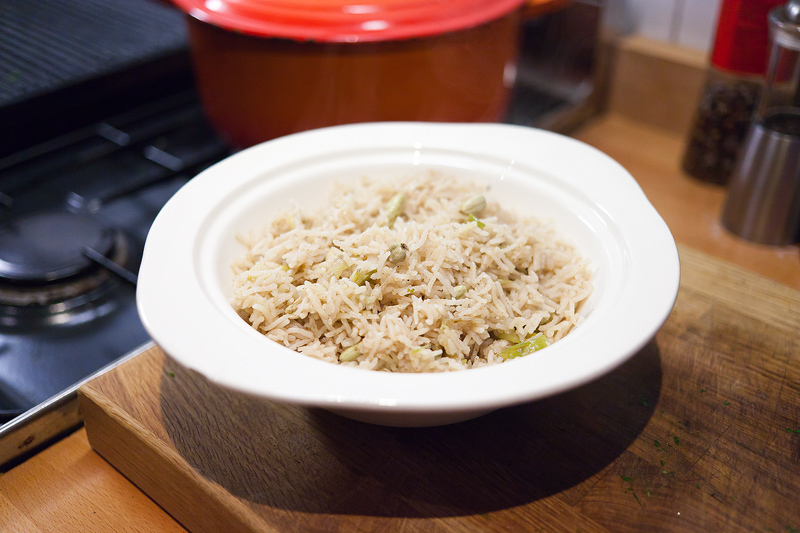 It also helps preserve the flavour of your rice – this is important when cooking basmati rice. Adding salt helps prevent the grains from sticking. If you have time, soak the rice for 1 hour but even 15 minutes of soaking will help you on your way. And then – Rinse the rice again and cover with clean water. How much water? I find that approx 1.5cm should do the job – this is about the size of my thumbnail so I dip my thumb into the water until it touches the top of the rice and I make sure the water comes to the top of my thumbnail. However – if you have abnormally large or tiny thumbs, you might not want to use this method. You’ll soon get used to approximating 1.5 cm of water anyway. Add salt to the rice. I like my rice salty so I add salt. If you don’t like your rice salty, don’t add the stuff. Now cook the rice – bring the water to a rolling boil – the rice should be uncovered up to this point. When the water is boiling, cover with a lid and reduce the heat slightly. Now – this raises a very serious question – “How do I check if the rice isn’t boiling too hard or if it’s finished cooking if it has a lid on and I’ve been told NEVER to take the lid off cooking rice?” Simple – take the lid off for a second and check. It wont make the slightest bit of difference. It will take about half a second for that steamy environment in the pan to reestablish itself so you really don’t have to worry when you lift the lid to check the rice. So – allow the rice to cook, covered with a gentle, rolling boil. Lift the lid, check it – when all the water has disappeared remove the pan from the heat. Some methods call for further cooking of the rice over a very low flame but I think if you leave the rice for long enough covered in the pan, the cooking process will continue, the rice will be perfect and the process will have been less vigorous on the rice grains. Leave it for 10 minutes or so – it wont go cold. You can cover it with a towel if you must but it won’t really help. Remove the lid. Water vapour will rise. Allow the rice to sit there, in the pan, with the water-vapour rising for a minute or so. Now gently fork through the rice and allow more moisture to escape. Your rice should be light, fluffy and nicely separated. As long as you rinse the rice and soak it, the cooking process really doesn’t need to be that precise – it’s the preparation that makes this work. If you’re cooking the rice with other ingredients, e.g. you’re cooking a pilaf, add these before you add the soaked and rinsed rice back to the pan. I fried off some spring onions and added whole green cardamoms along with a pinch of garam masala. I then added the rice that I’d soaked for 1 hour, stirred it around to coat the grains and then added the water and continued the process as above. Getting your rice right is important – my method is by no means the only way to cook rice and I’m sure there will be responses to this post pointing this out but so far, this is the method that I rely on to get the best results. Oh – one more thing… never rinse your rice AFTER you’ve cooked it.. Never. I’ve seen it done and it really wont help you. So don’t do it.